Plants should be putting on a spectacular show this time of year. 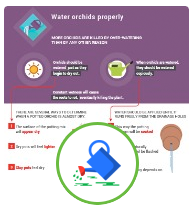 Adjust all staking and twist-ties and be on the lookout for aphids, slugs and snails. Give adequate water because flowering strains the plants. As new growths appear later, increase the nitrogen level in the fertilizer. 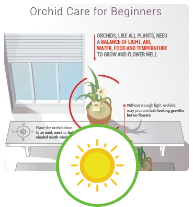 Should a plant loo healthy but not be blooming, try increasing the light during the next growing season. The number-one reason for no flowers is lack of light. These hard-cane dendrobiums will be at their flowering peak now. 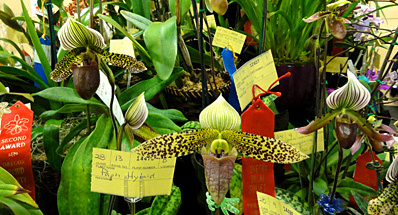 It is not unusual to see a specimen of this type in an orchid show boasting 1,000 flowers. 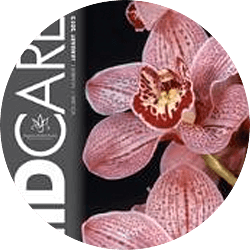 The secret with this group -- bred primarily from Dendrobium kingianum and Dendrobium speciosum -- is to provide ample water, fertilizer and light during the growing season. This marks the beginning of the flowering season. Amazing displays of color will dazzle the grower over the next few months. Prepare your plants for optimum display by staking spikes (if needed) and cleaning off the older yellow foliage. Do not miss the wonderful fragrance as the flowers unfold..
March is the beginning of the season of heaviest potting for lady's-slipper orchids. However, it is a month where the volume of plants needing attention is still small. 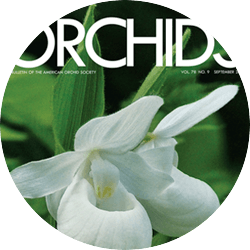 It is an excellent month to take the time to work with your paphiopedilums before the pressure of other potting prevents your doing the thorough job you should. Look at each plant: Is it clean of dead and dying foliage? Is it weed free? Does it need potting? Is it in spike? Does it have an insect problem? Cleaning and restaging your paphs is one of the most satisfying tasks of the orchid year. Cleaned and potted paphiopedilums look happy. The summer-blooming types will be showing the first of their buds in March and April. Be on the lookout for the buds, as well as any insect pests that may have found their way into the crowns of your plants. It is especially difficult to clean mealybugs, in particular, once they have become established in the plant. Better to get to them before they get a good toehold. Increasing light levels should give emerging spikes the strength they need to grow straight and strong. Do not be too anxious to stake the spikes, because if they are staked too soon, the flowers may develop a "nodding" stance, where the dorsal will not stand upright. 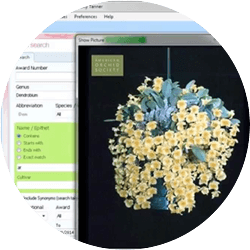 If the spikes seem to develop at an angle, let them, and stake after the flower has hardened for best carriage, especially on the hybrids with fairieanum background. In most of the country, March is the peak blooming month for phalaenopsis. 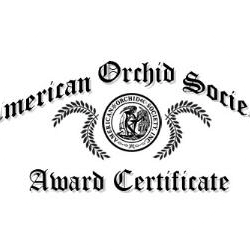 Staking needs to be carefully attended to, so that the flowers will be displayed at their best for orchid shows and judging -- even those intended for your home will look best if properly staked. One of the most decorative aspects of phalaenopsis spikes is the way they gracefully arch. If not staked properly, the spike will lack this grace and will not be as pleasing. Most growers like to have the final support just below the first flower, allowing maximum support, without sacrificing the beauty of the arching spike. Rapid-growing spikes and open flowers place extra demands on the plant. Careful monitoring of watering and feeding will give the plants the energy they require to give their best floral display. Remember, too, that the lengthening days will also increase the frequency at which plants need water. Beware of the invasion of sucking pests that accompany the flowering season. Flowers and spikes are favorite targets of mealybugs and scales. Be on the look out for their presence, often indicated by the appearance of sooty mold resulting from the exudate of the bugs, and treat before flowers or buds are too advanced. 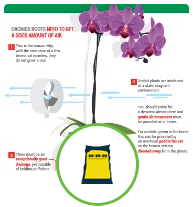 If flowers and buds are too far along, the chemical treatment may damage or abort them. AM/AOS photographed at Parkside Orchids.